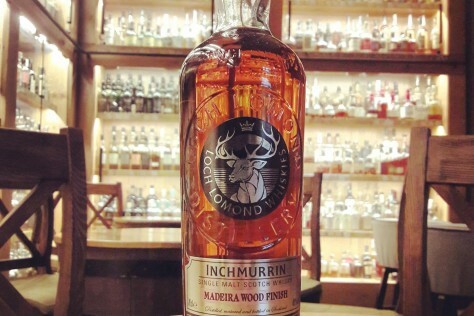 #Inchmurrin Madeira Wood Finish / 46% – Inchmurrin single malt is produced at Loch Lomond Distillery. It is named after the island of Inchmurrin, the largest in the Loch Lomond island group. In 2014 the distillery changed ownership, when the management took over operations with the financial backup of Exponent Private Equity Group. New owners immediately rebranded the range and added new expressions. Inchmurrin Madeira Wood Finish was launched in 2015 as part of the Island Collection. The whisky was aged in traditional American oak barrels and finished for unspecified period of time in casks, that have previously been used for making fortified Madeira wine. Nose: malty and fruity, plums, peaches, oranges, almond croissants, sweetened lime juice, hints of nutmeg and lemon grass. Palate: smooth, peaches, baked apples, butterscotch, honey roasted almonds, candied orange peel, touch of lemon grass and oak. Finish: medium long, oaky and nutty with delicate fruity sweetness.